Goodreads: In this charming, evocative, soul-touching novel, she once again takes us deep into the heart of the magical Lowcountry where three amazing middle-aged women are bonded by another amazing woman’s death. Kritters Thoughts: Three women end up single and living in Charleston, SC through different circumstances. They each need the others to help provide stability and a unit to get through the highs and lows in life. With three main characters that are potentially in their silver years, I didn't completely connect with them and this was probably the main reason why this book just didn't do it for me. 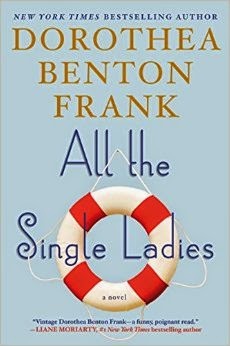 I am a fan of Dorothea Benton Frank and will continue to read her books, but may pay a little closer attention to the synopsis next time! If you are a reader who may be older than me or enjoy characters who are, then this could be right up your alley. I did love the setting! Charleston is a great city and the reader gets the feeling of this fantastic city from page one to the very last sentence. The Southern charm oozes throughout the book. Although the characters weren't it for me, the setting definitely made up for it! I think I'd like the premise although I'm not in my silver years yet either. But I like the Ladybug Farm books and the Ladies of Covington series. Unfortunately, every time I read DBF I don't like her style of writing. I always want to like the books, but I probably would prefer the stories as movies. I've always wanted to visit Charleston!